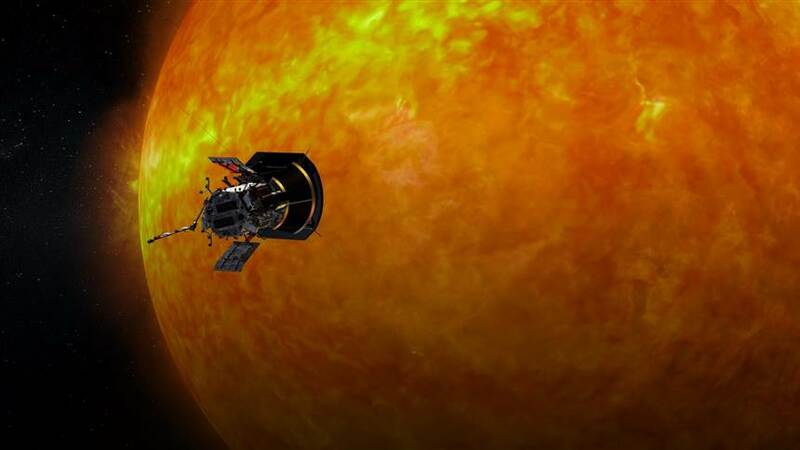 NASA set to touch the sun: Parker Solar Probe launches Sunday. THE NASA Parker Solar Probe has blasted off from Florida’s Cape Canaveral air base in a seven-year mission to explore the Sun’s outer-atmosphere. The car-sized spacecraft was successfully launched on board NASA’s Delta IV Heavy rocket at 8:31am UK time (3:31am EDT). The £1.17bn ($1.5bn) probe will become the fastest-moving manmade object in history, travelling around the Sun at 430,000mph. NASA said the daring mission to ‘touch the Sun’ will help scientists unlock some of the solar system’s greatest secrets. Thousands of people gathered at the Cape Canaveral Air Force Base this morning to watch the Parker Solar Probe take off. The launch was originally set for Saturday morning, but was scrubbed at the last minute due to technical glitches. NASA’s historic mission will study the Sun’s incredibly hot outer atmosphere, called the corona, from 3.83 million miles away. British-born project scientist Dr Nicky Fox said: “The Parker Solar Probe is going seven times closer than anything has ever been before. “We’re actually going to be within four million miles of the surface of the Sun. “I realise that doesn’t sound very close but if you put the Earth and the Sun one metre apart, Parker Solar Probe would be 4cm from the Sun. Parker Solar Probe, which is expected to complete 24 orbits of the Sun, will use Venus to adjust its course. The Parker probe is named after US astrophysicist Eugene Parker, who developed a pioneering theory on supersonic solar wind in 1958. Speaking after the launch, the 91-year-old told NASA TV: “It’s a whole new phase and it’s going to be fascinating throughout. “I’m anticipating that the results will turn up basic information about why the corona of the Sun is at one million degrees.